At the end of last year and during the holiday season I kept my head down, busily reading for the CYBILS first round of judging. 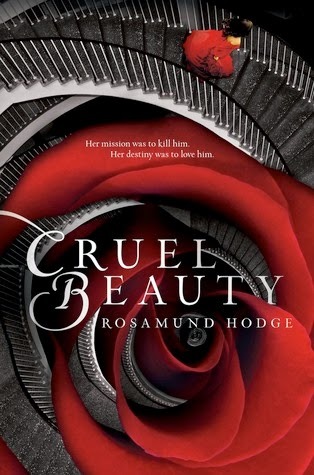 Perhaps that’s how I missed early buzz for Rosamund Hodge’s fairy tale retelling Cruel Beauty. When I looked around in January, there were positive (glowing, really) reviews for the book on blogs as far as the eye could see. Overnight I went from interested to must buy it the day it comes out. And that’s the story of how I found myself reading (and liking!) a compelling fantasy about a girl who hates everything, but most especially her fate. Nyx Triskelion is the daughter of the leader of the Resurgandi, a group pledged to overthrow Arcadia’s demon ruler, the Gentle Lord. Before her birth Nyx’s father made a bargain to marry one of his daughters to the Gentle Lord on her seventeenth birthday. Nyx has been training to kill that demon since age nine, all the while guarding hate in her heart, lest it mark her twin sister, too. The trouble is that Nyx’s plan is a suicide mission. She knows it. Her father knows it. Her husband knows it. The only option left is to carry out the plan, if she can. The official book summary (in the gray box above) makes much of the Beauty and the Beast overtones in this story. As many other reviewers have noted, however, Cruel Beauty does more homage to the Greek myth of Cupid and Psyche, and there are strands of many other fairy tales woven into the whole as well. BUT. This is more than a retelling. It’s a book about memory, knowledge, sacrifice, and clues left at the edges, about self-hatred and redemption, and about the stories that can be built between the lines of any life. Nyx is an interesting character. For the first fifty pages of the book, I wasn’t sure I wanted to keep reading about her. She had so much poisonous hatred in her heart, and it (inevitably) spilled out into her life and the lives of the ones she was meant to love. I’ve realized that I am not one to challenge myself by reading about difficult characters, so Nyx was a stretch. What kept me going, then? Her absolute determination, her intelligence, and her willingness to take unbelievable risks. For those first few chapters I thought to myself, ‘Textbook depressive personality,’ and then for the rest of the book I was swept into the story, into the incremental changes in Nyx’s actions and purpose, and into a hope for a better ending. Any first-person narrative rotates around its main character, but of course Ignifex (the Gentle Lord), his shadow and his house also loomed large. I didn’t find the book quite as swoon-worthy as expected – the central romance didn’t appeal to me that way. However, the banter between Nyx and her husband and the mysteries of the house did appeal, immensely, as did the theme of trust growing on rocky ground. I was also enchanted by the Greek mythology and theology sprinkled throughout. There were notes of other myth traditions, too – it was really a smorgasbord of tales and allusions, and I adored that aspect. I do think that could be a negative for some – if they don’t know their mythology well, the allusions would then seem like dead ends, rather than offshoots of world-building. In that respect, I believe Cruel Beauty is one of those books that will mean or speak wildly different things to different readers – much of its meaning and beauty is hidden in allusion and metaphor. In all, I thought Cruel Beauty was a rather wonderful read, with lovely bits of mythology and fantasy woven in to complement a story about a mysterious house and its owner, and the girl determined to destroy them both. Recommended for: fans of Charles de Lint’s darkness, Robin McKinley’s Beauty and the Beast retellings, and Merrie Haskell’s The Princess Curse, those who like fairy tales, mythology and perilous bargains, and anyone who can appreciate beautiful writing that hints at the true self hidden deep in our hearts. I have heard so much praise for this book! I can't wait to read it. I am glad you mentioned that it took you about 50 pages to really get into the story. Sometimes I can get frustrated with a slow start, though I do try to give it at least 50 pages, I don't always. So thanks for letting me know that it will pay off! Great review.